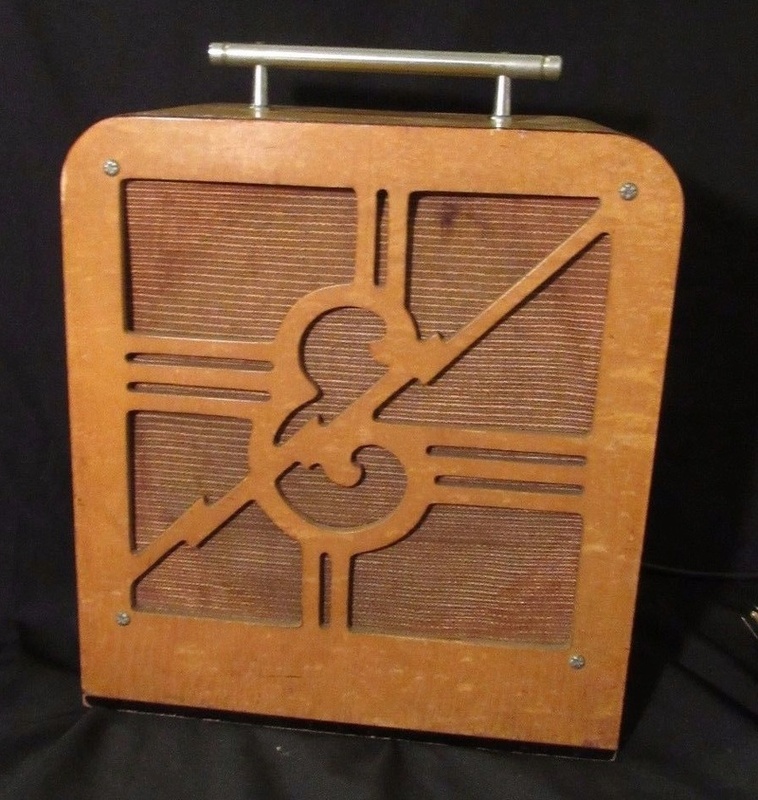 So, I purchased a 1943 Epiphone Century guitar amplifier from an antique store in near museum condition. It was original and in working condition. I emphasize "was" as it isn't any more. 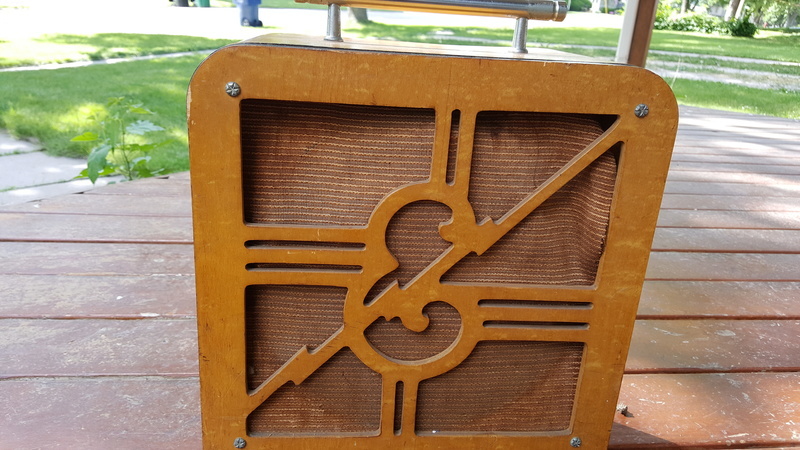 This amplifier was on the road with at least 4 documented bands during the '40's and 50's before it became an heirloom in somebody's personal collection until his death. Despite all the bad weather, bouncing around in vans, and general barroom conditions, it survived in near perfect condition....until today. I had it shipped via FedEx as they are normally the safest. 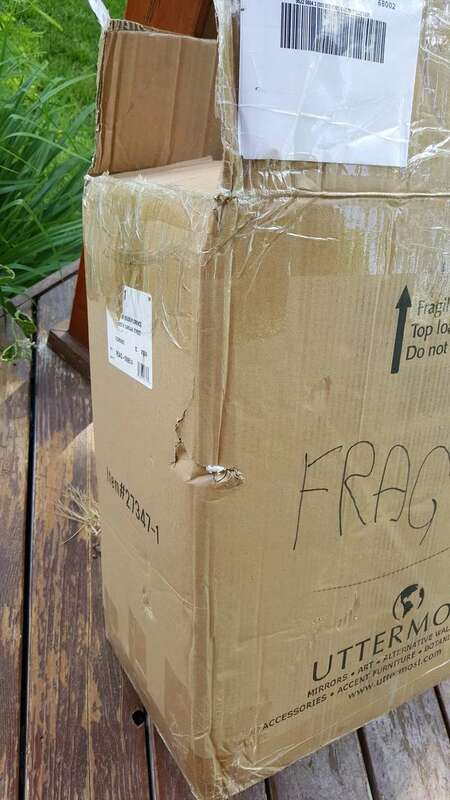 Box was packed well, marked "fragile", "Contains glass", "Do not lay on its side", and "No fork lifts". All of which meant nothing as it arrived with a puncture hole in the box side by a fork lift. I pulled the amplifier out of the box and removed all the packing only to find something that reminded me of a can of marbles. My theory is that the box was dropped from some height (fell off a stack maybe) because the speaker inside the amp had ripped away from the baffle tearing the grill cloth, busting all the vintage vacuum tubes, and even knocked the back panel right off the cabinet!! The panel was held on by 4 wood screws and the speaker was attached by 4 t-nuts until the shipper "handled" it. I almost got sick watching it. I took it to my amp tech right away since I couldn't see straight. He has great doubts regarding the survival of the old field coil speaker. The tubes I can probably locate at some cost, but not that original speaker. I will go back tomorrow and see what it looks like after I calm down. I will be putting in a claim for damage, but I doubt I see much and it will not do much for that amplifier unless they pay me with a vintage speaker. No offense to the shipping companies out there, I understand that they ship millions of boxes all over the world without damage, but it is becoming more and more common to see forklift punctures in boxes marked fragile. This will be my 3rd one in 6 months. Maybe they should focus less on speed and more on better handling. I would rather wait another day or two than to see my stuff busted to pieces. It "was" a really cool vintage amplifier. Seems obvious what went wrong here....yup, still upset. I would raise Cain the shipper. Believe me Matt, it does. I still feel a little nauseated over it. It was a beautiful amp and spotless inside. Now it is just pile of broken glass and parts. It should still be fixable, but it will never be like it was nor sound like it did. Here is Tom Forst doing his thing with his vintage Epiphone amp in the background. He often plays through 2 of them on stage....such a great sound. How much did that amp cost you if you don't mind me asking ? Also you should've opened the box up before signing for it and just refused delivery and claim damage right away, that will increase the likelihood of you getting paid by insurance. That was part of the problem, it was shipped without signature required so it was just left on the porch like that. Since exterior of the amp isn't damaged, I don't see FedEx willing to do anything on this. It wasn't cheap, but it was a good price for the condition that it was in. Now I have to locate vintage tubes and pray that the speaker wasn't damaged...which I will not know for awhile. To make it more difficult, there is not much information out there on the tube complement so I have to go off of what was in it....which is now smashed into bits. The shop is attempting to put the pieces together to figure out the right part numbers as they were nothing like the modern tubes. It may never be playable again....will not know for at least a week or two and even if it can will likely be a different tone. The cabinet is okay, but when you see that 70+ year old grill cloth mangled, you know things are not good inside....and it sure wasn't. Last report, the transformer may be damaged as well. I might have caught a break. That amp is so old that it uses a somewhat rare set of tubes....which also has very little demand for, so I found a set. According to the shop, the speaker appears to have survived, so in a couple of weeks, I might have it whole again. I will be lighting candles and crossing my fingers until then though. With luck, it will not cost me more than a couple of hundred to get it fixed up. Still pissed, but at least it may survive. Then you can post a video of the sound it makes, and we can all sing cumbaya. Right now I just hope it makes a sound other than static.